American publishing in the long nineteenth century was flooded with readers, primers, teaching-training manuals, children’s literature, and popular periodicals aimed at families. These publications attest to an abiding faith in the power of pedagogy that has its roots in transatlantic Romantic conceptions of pedagogy and literacy. 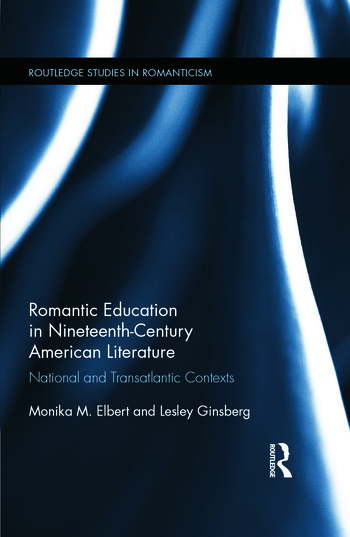 The essays in this collection examine the on-going influence of Romanticism in the long nineteenth century on American thinking about education, as depicted in literary texts, in historical accounts of classroom dynamics, or in pedagogical treatises. They also point out that though this influence was generally progressive, the benefits of this social change did not reach many parts of American society. This book is therefore an important reference for scholars of Romantic studies, American studies, historical pedagogy and education. Monica M. Elbert is Professor of English and Distinguished University Scholar at Montclair State University. She is the outgoing Editor of the Nathaniel Hawthorne Review. She recently co-edited Transnational Gothic: Literary and Social Exchanges in the Long Nineteenth Century (2013) and has published extensively on nineteenth-century American literature, Gothic literature, and women’s writing. Lesley Ginsberg is Associate Professor and Chair of the English Department at the University of Colorado at Colorado Springs. Her essays on nineteenth-century American children’s literature appear in journals including American Literature and Studies in American Fiction and in edited collections including American Childhood, Enterprising Youth, and The Children’s Table.